Marcelo, The Champion is totally different from the rest of the running elite athletes that I’ve known. I had the chance to be with him for almost 7 days/one week. And for the those days that I’ve with him, I found a lot about the personal life, attitude, behavior, and inner thoughts of this runner. I went up to Baguio City to personally meet his “handler”, the one who he said to be the person who had helped him in his running career before I discovered him in the 1st Marcos-Kennon 50-Mile Run. “Che” Alberto is Baguio City’s Number #1 Running Event Organizer and Marcelo’s running sponsor in running events where he would join. She is a nice lady and practically knows the life of Marcelo. But I did not ask her about the details of the life of Marcelo. It was enough for me to know and meet her personally. And with the brief meeting with her, she provided me with copies of the published SUN STAR Baguio Newspaper where Marcelo was featured. I was amazed that the local newspaper featured Marcelo in a story with picture every time he finished as Champion in my Ultra Marathon Races. I was surprised! Marcelo did not even informed me about these publications since I could easily link them through my blog posts. Talking with “Che” Alberto was very brief and I reserved some time to ask Marcelo about his life. Knowing the details of Marcelo’s life should come from Marcelo himself. I was introduced also to the writer and sports reporter of Baguio’s Sun Star, Roderick Osis, who have written those sports stories/news every time Marcelo would join PAU’s Races and every time after Marcelo wins an event. Marcelo was so proud to introduce me to these people who are helping him in his passion to run in my events. Marcelo informed me that he had been interviewed by the local TV network for so many times and thereby, making him as the most popular ultrarunner and a household name in Baguio City! But Marcelo was not affected with such popularity as he remains to be silent, reserved, and humble. Before leaving Baguio City, he invited me to his house in the Dominican Hill area where he would get his things as he was going with me to Bataan in preparation for his participation in the 1st WC 200 Ultra Race. I was able to meet his wife. The couple do not have any children. They live in a decent house which the couple built in a lot which was part of the inheritance of Marcelo from his Aunt, sister of his mother. A day after coming from Baguio City, I brought him to Porac, Pampanga to conduct a recon run on the 22-Kilometer mountainous stretch of the Clark-Miyamit 50-Mile Trail Run. He was paced by Danin, one of my runners whom I brought to the place in one of my runs, and I gave them instruction of what to do during the run. I would bring them to where runners would usually start at Barangay Sapang Uwak and for them to run all the way to the Miyamit Falls. I gave instruction for them to take some pictures with the Falls as the background and have their “pit stop” thereat and immediately go back to where they started. Marcelo & Danin started the recon run at 6:00 AM and at 9:10 AM, they were back at the place where I released them. Mission accomplished! A recon run on this route usually takes 5 to 5 1/2 hours and these two runners did it for 3:10 hours! Amazing! I told Marcelo that he has another 10 Kilometers to run from the Falls all the way to the peak of Mt Miyamit. He was breathing heavily, silent, and very composed. I did not hear any complaints from him about those “killer” ascending parts of the route. Danin and Marcelo were smiling as they changed their running attire to drier clothes! As I reviewed the shots in my camera, they took a lot of time in the falls to eat and in some parts of the route where they posed for their pictures. I spent another two days living with Marcelo in Bataan before the start of the 1st WEST COAST 200 Ultramarathon Race. The Miyamit Run was his Taper Run for this 3-day multi-stage event. On these days, I got to know more about Marcelo. Marcelo is the youngest of 3 children (all boys) whose parents are unknown to him. His parents (both from Baguio City) gave their children to their brother/sisters for them to be taken cared of. Marcelo, being the youngest, was given to the parents’ relatives in Caranglaan, Nueva Ecija. Such town is the last town of Nueva Ecija in its northern side/boundary and it is located in a mountainous area. Because of its mountainous & rugged elevation profile, it is still a “hotbed” for the New People’s Army (NPA) operating in the boundaries of Nueva Vizcaya, Aurora and Nueva Ecija. This is where I had a lot of armed encounters with the insurgents when I was the Brigade Commander of the Philippine Army in the said area. Life in the mountains was very hard for Marcelo but he was raised as a good kid. He finished his Elementary and High School education in the public schools of Caranglaan, Nueva Ecija. But while he was studying, he was helping his foster parents to raise some agricultural crops in the mountains. But he takes pride of cutting those cogon grasses in the mountains as they are sold when dried along the Maharlika Highway as roofing materials. At one time after his graduation from High School, an attempt to recruit him to the folds of the New People’s Army was made. He was asked to join the Armed Movement with all those reasons to fight for the injustices of the government and the society. He was firm in his decision not to join the movement for the simple reason that it would not be good for his future. He left Caranglaan and asked his foster parents to look for his true parents. Actually, his purpose of leaving the place was to look for a better work, rather than be a farmer and cogon grass cutter in the mountains of Caranglaan or worse, as a NPA fighter! He tagged along with an older guy and a resident of Caranglaan who worked as one of the employees of Northern Cement Corporation (NCC) based in Sison, Pangasinan. At the NCC, he became a cement loader—he carries bags of cement to be loaded on a truck and off-load such bags of cement upon reaching its delivery point. A truckload of cement can accommodate 1,000 bags of cement and Marcelo shares the loading with two other companions. He is being paid 75 centavos per bag of cement he loads to a truck and another 75 centavos to off-load one bag of cement in its destination. At the average, he carries 330+ bags of cement per delivery and that is multiplied by two to complete the work. He even boasted to me that he can carry two bags of cement at one time. At the age of 16 and with the height of almost 5 feet, you might wonder where he is getting such strength! He stayed in Sison, Pangasinan and worked as cement loader for two years! Life is hard for Marcelo during those years but he survived. But he suddenly thought of another way for him to change his life. He thought of looking for his true parents. Looking at the address of his parents from his Birth Certificate, he was able to trace and locate such address. He was able to re-unite with his brothers but he was sad to know that his parents had died already due to sickness. The sister of his mother was the one who took cared of him and he was back again in Baguio City for good. Marcelo told me that he tried his luck to become a soldier where he had to spend a lot of money for documentation and travel as he was asked to follow-up his application to the Philippine Army recruitment office somewhere in Pangasinan in the early 2000’s. I was surprised to know his story about his plan of being a soldier. I have a suspicion that he could have failed in one of the screening examinations or he was not qualified because of his height. His failure to enter the military service did not deter him to pursue a better life. He became a construction worker in some of the buildings and residential houses in Baguio City. And later, he applied as a Janitor in one of the Shopping Malls inside the Baguio City Market. Marcelo did not complain about his life and he lived very simple and decent. And at one time, he attempted to apply as OFW (Overseas Filipino Worker) but it did not materialize until his passport expired. It was not his luck to become a soldier and OFW but being being able to look for his brothers and his aunt in Baguio City gave him a “home” to stay at. His Aunt had a house and lot property in Baguio City and Marcelo became as one of the heirs of the property when her Auntie died due to old age. As part of his inheritance, he constructed a decent small house in a lot located on the slope of the famous Dominican Hill in Baguio City where he lives with his wife. He was proud to invite me into his house for a cup of hot coffee and I really appreciated his gesture/invitation. I was able to meet his wife who was busy ironing her clothes and uniform. The wife works as a Security Guard at the Baguio City Export Processing Zone. On the wall where a small old TV is flashed, you could see framed “blow-up” pictures of him being awarded as the Champion of the 1st PAU National Championship in Guimaras. Only medals and trophies where he was the No. 1 and/or Champion were placed on top of the TV and I know that all of these came from my races! He started to run and join short road races exactly ten (10) years ago and finished his first Marathon race in 2007 with a time of 3:10+ hours. The love of running was planted in the mind of Marcelo when his Uncle who now lives in Canada advised him to start training as a long distance runner. 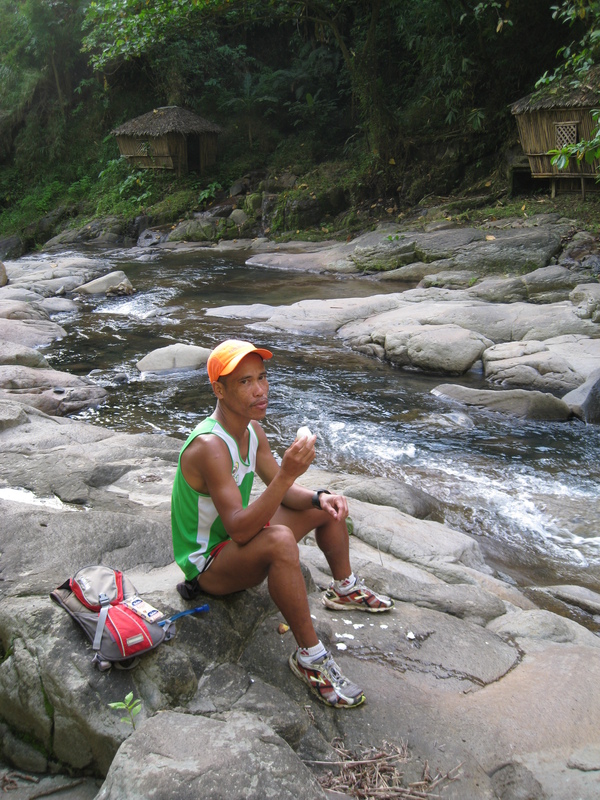 He improved progressively through the years by asking from his Baguio running friends about their training and advise. He takes pride in telling me that he was the FIRST Champion in the 1st Philippine Skyrunning Association’s Race in the country which was held in Benguet/Baguio City. 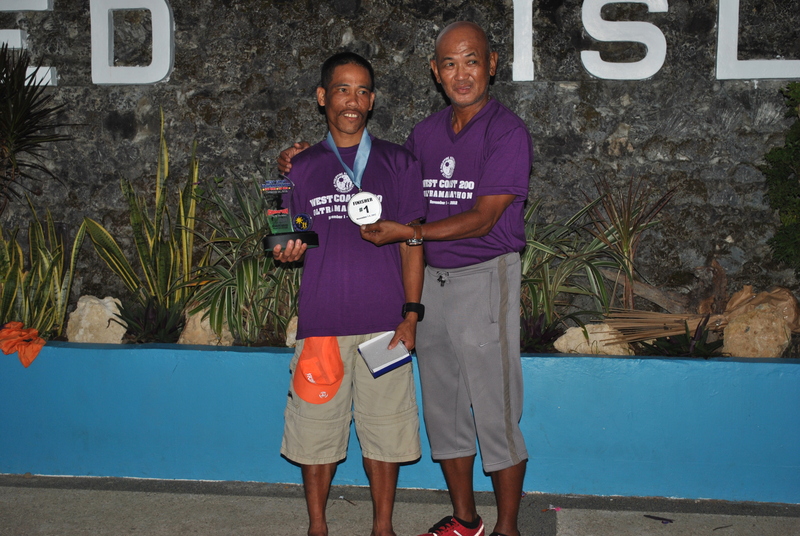 He won his first Champion Award as an Ultrarunner in Bad Circle’s Ilocos Norte’s 50K Race last April this year beating some of the best runners from Baguio City. From this ultra event, it was a non-stop win for Marcelo in every ultra event that he joined. But, after winning the first Marcos-Kennon 50-Mile Ultra Race last June, he became the most popular ultrarunner in the country! During those 3 days that I’ve observed Marcelo during the 1st WEST COAST 200K Ultramarathon Race, he was very calm, silent, and raring to finish each leg of the event. I told him that the event is not a Race for him because I gave him the information that nobody could equal his speed and endurance. All I need for him to do was to Finish the Race without any injuries and set the FIRST Official Course Record of the Race. I was thinking that he could finish the race in 21 hours or less and not less than 20 hours but he proved me wrong. Even if I told him that the next runner behind him is 8-9 Kilometers away, he would still steadily increase his pace and shorten his brisk walking breaks. During the evening run (last day), I was able to catch up with him to provide his water needs at Km #28 which was the halfway mark. He asked me if he had ran a distance of 10 Kilometers already. And I thought he was delirious or losing his mind. I said to him that he had ran already a distance of 28 kilometers and he was on the halfway of the course distance. He was shocked and excited. As he resumed his run, he was looking at his back trying to see in the darkness if there is a glimpse or sparkle of light from the runner behind. He could see nothing as the next runner was 8 Kilometers away! When he reached the finish line in Barangay Lucap, Alaminos, Pangasinan in 5:15+ hours, he told me that he could have delivered a faster time if I did not stop him for a water re-supply 7 kilometers away from the Finish Line! I wonder what a minute of stop could possibly make a difference from his record time of 19:32+ hours! A record time which was too fast from my predicted time for him to finish the race. But the truth during that night run was the fact that he was delayed by stopping and talking to the owners of those dogs running after him. He would tell them to pay for his purchased plane ticket for his trip to the next year’s Hongkong 100K Ultra Trail Race if ever he is bitten by their dogs! Through my FB Live Update of the WC200, words spread immediately about Marcelo winning the event and his running friends in Baguio City were surprised about what Marcelo have done for the past 3 days. It was the FIRST in the history of road racing in the country where runners have to run in 3 consecutive days that most of the ultrarunners have feared of what would happen to their body after running 70 kilometers for the first day and for them to start again to run an ultra distance (70K) for the next day and another 60K for the last day. During his “low” moments, he would lament to me why he was not included among the five (5) selected Baguio City runners who were supported to join/participate the 2013 Bataan Death March (BDM) 102K Ultramarathon Race. I was surprised to know this information from him. It seems that nobody from Baguio City offered to sponsor for him to join the 2013 BDM 102. Well, I told him that he has a reserved slot for the race because a “Good Samaritan” has already paid for his registration fee and he has to prepare for the race. How does Marcelo train for an ultrarunning event? Long Runs! As preparation for the 1st Marcos-Kennon 50-Mile Run, he would take a bus at midnight from Baguio City to Carmen, Rosales, Pangasinan and from Carmen, he would run all the way back to Baguio City via Kennon Road, a distance of 85 kilometers where the last 35 kilometers is uphill up to an elevation of 5,000 feet above sea level. The shorter version of his long run would be from Urdaneta, Pangasinan to Baguio City, a distance of 70 kilometers. Since he boards the bus in his running attire (shorts & singlet), the conductor would ask Marcelo to sit on the last row of seats in the bus. With small cash in his shorts’ pocket, he would make it back to Baguio City with an impressive time, averaging at 10 kilometers per hour on “self-support” mode! His nutrition and hydration needs? Definitely, he is not fond of sports gels and sports bars! He eats solid foods like boiled bananas, boiled sweet potatoes & potatoes, boiled eggs, Cloud 9 chocolates, and lots of water to drink. He only take some sips of Sports Drinks like Gatorade and I force him to drink Ice Cold Coke on the last 7-10K of the race on each leg of the WC200. He does not take any “pain-killer” tablets but he is fond of Pharmaton! On average, he takes two (2) Pharmaton capsules every day during the 1st West Coast 200 Ultra Run. 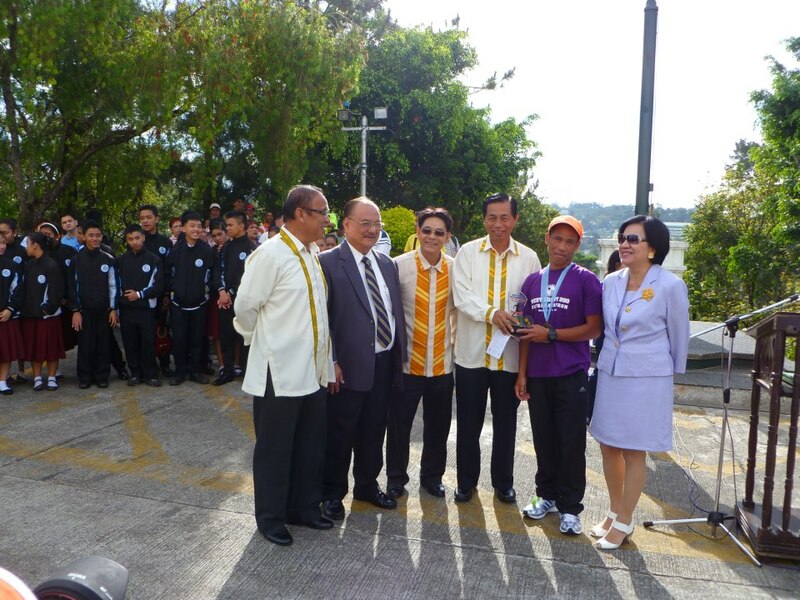 After being featured lately in a local newspaper for winning the 1st WC200, his sixth (6th) consecutive win in Ultra Events, being interviewed by a local TV network, and being presented to the Baguio City Government’s Mayor, City Council & Employees as Baguio City’s Pride in Ultrarunning, Marcelo remains to be humble and silent about his accomplishments. What impressed me most is that he does not ask for any monetary reward for his winnings. He told me of saving some of his salary for him to buy few bags of cement and make those temporary steps/stairs to his house to be made as concrete and not as bags of soil/earth dumped to form as stairs. Other than that project, he is simply passionate in his love to run and prove to himself that he is still have the speed and strength in order to explore his limits in ultrarunning. What he thinks of his future? He is excited to travel outside the country to carry the national flag in the Vibram HK 100K Ultra Marathon Race, a chance to fulfill his dream to travel and compete in a running event abroad. ***Those who finished the 2nd leg whose times were more than 14 hours were allowed to run for the next stage the following day (last stage). ***Those who finished the 1st leg whose times were more than 12 hours were allowed to run for the next stage the following day. 1. 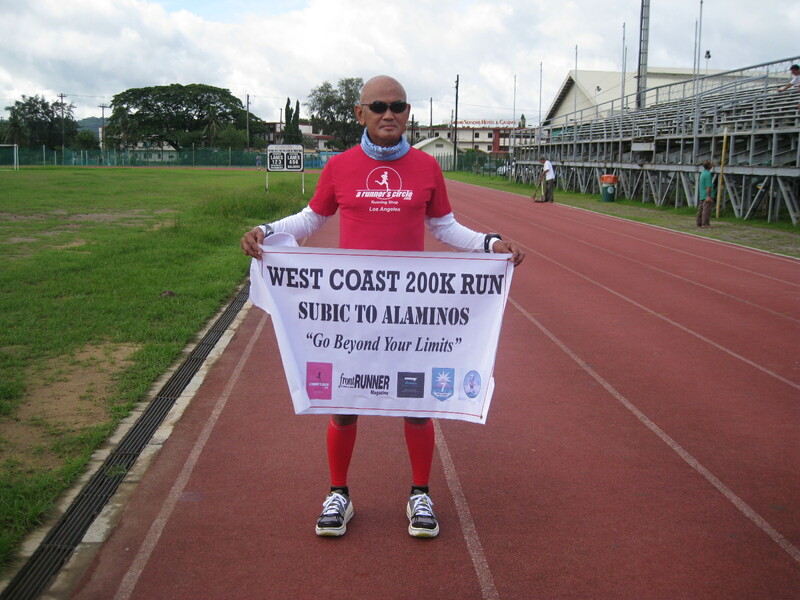 WEST COAST 200K (WC200) is multi-day stage run, a run of three (3) consecutive days which will start o/a 5:00 AM of November 1, 2012 at the Remy Field Oval Track at Subic Freeport (Olongapo City) and ends o/a 5:00 AM of November 4, 2012 at the Port of Barangay Lucap, Alaminos, Pangasinan. 2. This is a SOLO run. 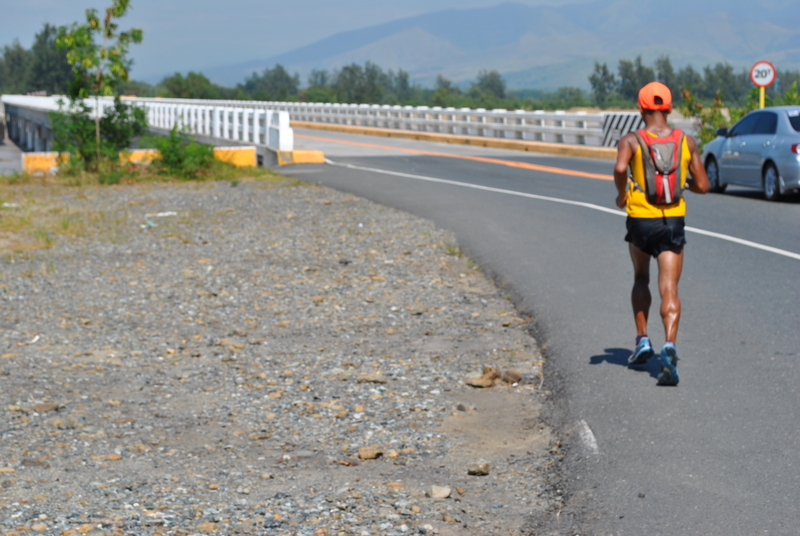 Runners will run along the Olongapo-Alaminos Highway covering a distance of 200 kilometers. A runner-participant has the option to join as an unsupported or supported. A supported runner can avail of a support vehicle and support crew. An unsupported runner will be on his own as he/she can avail of convenience stores & eateries along the route. 3. Pacer/s are not allowed. 4. Runners should always stay on the left side facing the incoming traffic. The race route is an Open Road and the runners shall share the road with other vehicles. 5. Support vehicles should always park on the far RIGHT side of the Highway. A runner will be disqualified if his/her support vehicle is parked on the Left side of the Highway. Support Vehicles shall not be allowed to “shadow” their runner. Only four-wheeled vehicles are allowed as support vehicles. 6. Runners will run or cover a distance of 70 kilometers on the FIRST Day. Runners shall assemble at the Remy Field Oval Track in Subic Freeport and the race shall start at 5:00 AM of November 1, 2012. The Finish Line/Area will be the Municipal Plaza of Botolan, Zambales. The cut-off time is 12 hours. 7. On the 2nd day, runners will run/cover a distance of 70 kilometers. 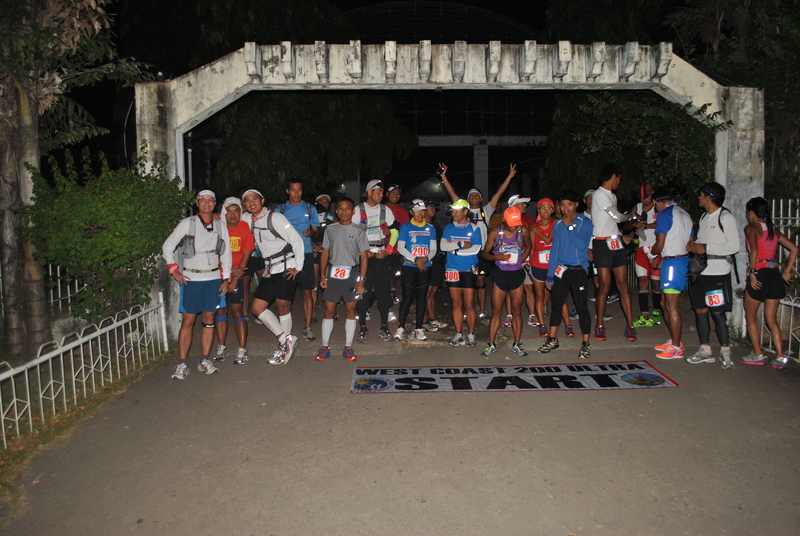 Participants should be at the Starting Area (Municipal Plaza of Botolan, Zambales) before 5:00 AM of November 2, 2012. The race shall start at 5:00 AM and the Finish Line will be at the Municipal Plaza of Infanta, Pangasinan. The cut-off time is 14 hours. 8. On the 3rd day, runners will run/cover a distance of 60 kilometers and it will be a NIGHT Run. Runners should be at the Starting Line (Municipal Plaza of Infanta, Pangasinan) before 7:00 PM of November 3, 2012. The race shall start at 7:00 PM and the Finish Line will be at the Port of Barangay Lucap in Alaminos, Pangasinan. The cut-off time is 10 hours. 9. Podium Finishers’ Awards/Trophies will be given to the Top 3 Male & Top 3 Female. Finish Times for the 3 stages will be added and Finishers will be ranked from the fastest total of finish time to the slowest. Official Finishers (Finishers within the Cut-off time) will be awarded with a Finisher’s Medal, Finisher’s T-Shirt, and Certificate. Points for the PAU Runner of the Year will also be awarded. 10. A runner is declared DNF once he/she could NOT meet or finish the stage within the prescribed cut-off time. The runner will not be allowed to run in the remaining stages of the race. 11. There will be NO Aid Stations along the route. NO Drop Bags will be allowed. 12. It is mandatory for every runner to have his/her hydration system; headlight/lighting system; reflectorized vest; and first-aid kit. 13. Unsupported runners could bring their camping tents and their extra clothes to be deposited at the RD’s vehicle which will be brought directly to the Finish Line of each stage. 14. Each of the Municipal Plaza in Botolan, Zambales & Infanta, Pangasinan has a Covered Court (with Comfort/Bath Rooms) and Lawn Area where runners could sleep/rest and take a bath. Please don’t litter on these areas. 15. Runners will be responsible for their meals and accommodation if they prefer to be housed in hotels/pension inns/resorts/homestays. There will be no curfews as it will be the personal responsibility of each runner to have his recovery and rest every after stage. There will be NO “socials” in every stage of the run. 16. This is the FIRST Multi-Day Stage Run to be held in the country. Let us maintain the INTEGRITY of this run and be proud to be a participant and much more if you intend to finish the event. 3. Westcoast Beach Resort & Restaurant. Contact Person: Mr Jun Gimeo. Contact Number(s): 0917-732-0716/0918-985-9352. 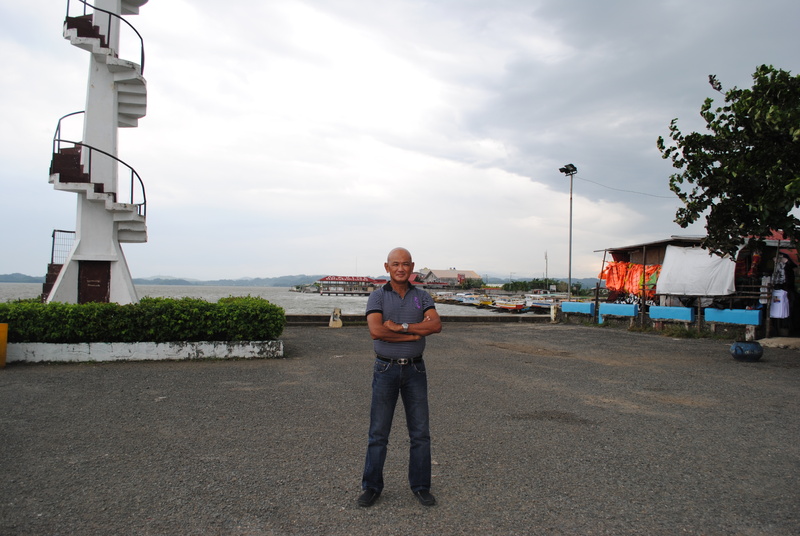 In Infanta, Pangasinan, there are NO resorts. hotels, or pension inns. There are restaurants in the nearby town of Sta Cruz, Zambales. Additional information on hotels/pension inns in Sta Cruz, Zambales will be posted soon on my Facebook Wall’s Event Page. In the military, if you are caught “sleeping on post” during a guard duty, you will face a “military court martial” and if you are found guilty, it means the end of your military career. 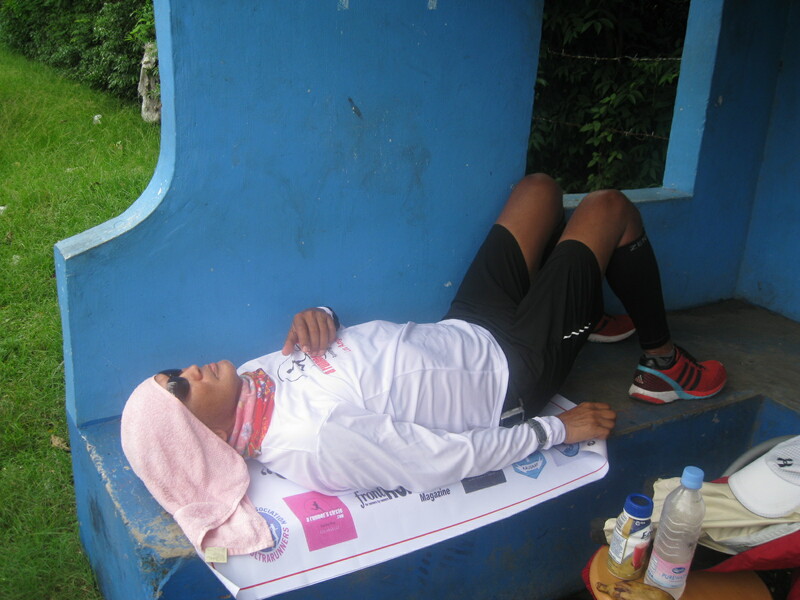 Well, this is how an ultrarunner looks like when he is “sleeping on post” during an adventure run…and during those times when he misses his regular posts in this blog (joke!). The picture below says it all!